On three separate occasions, I have heard the words, “You have cancer.” Each of these moments came at a very different point in my life. Each affected me differently. 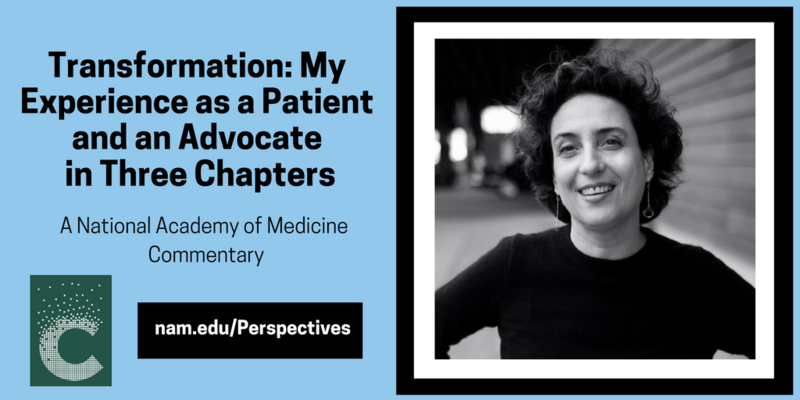 Now, with 25 years’ experience as a patient, a survivor, and an advocate, I want to reflect on the ways cancer has influenced the person I have become, my evolution as an advocate, and the profound changes in the field of advocacy. As I matured from the young woman I was when this story began to the older and more seasoned veteran I am today, my understanding of what it means—and what it takes—to be a patient, a survivor, and an advocate has grown too. It’s funny what you remember about the moments in which your life completely changes—the indelible images, the unforgettable words. I am walking behind two middle-aged men. They are talking to each other, intensely, about me. They are dressed almost identically: navy blazers, white shirts, khaki pants. One is my oncologist; the other is my father. I have an oncologist now because I have just learned that the weeks of numbing fatigue and strange symptoms I have experienced have a name: non-Hodgkin lymphoma. It is the weekend before Thanksgiving, 25 years ago. My father has flown to Los Angeles from Milwaukee, where he lives and practices internal medicine, to be with me. When the oncologist gave me the diagnosis, he thought he was softening the blow by saying, “I have good news and bad news. The bad news is you have cancer; the good news is that we can treat it.” He and my father are now deeply immersed in discussing the “good news”—specifically, what my treatment will be. They don’t actually talk to me about the plan. Their sole focus is on coming up with a clinical regimen that will save my life. No one asks me what is important to me, what I am most worried about, or what I need to know. At that moment, it doesn’t occur to me that there is a different way of approaching choices for my cancer treatment. After months of having my symptoms and fear that something was really wrong with me dismissed by my primary care physician, I am relieved that what I was experiencing has a name and that there will be a plan to make me better. I am 35, recently divorced after a short marriage and absorbed with my life. I have an emerging and very satisfying career in the art world. My biggest concerns are the ups and downs of relationships, whether I will have children, and whether I will stay in LA after my divorce or return to New York City, where I feel most at home. I had never thought about having cancer and had never heard of non-Hodgkin lymphoma, so I trust, totally, these two men to know and do what is best for me. I don’t even think about questioning them or their judgment. I just want what they want—for me to get better. I don’t know what it could mean to advocate for myself or to understand what the decisions being made for me then could mean for me in the future. The good news turns out to be just that. I get through the months of treatment and emerge on the other end, physically weak, thousands of dollars in debt, and officially now a “survivor.” My old life is probably still there, but I can’t go back to it. I need to take my experience and make it mean something for myself and for others. I am drawn to contemporary art, especially photography, because those images challenge us to see the world differently—to notice detail, nuance, light and dark; to experience the world through the lens of others; to bring diverse voices to a broader public—to get beyond ourselves. Art is transformational. Art opens doors and windows of perception and understanding, and for me, cancer did as well. As a result of my first cancer diagnosis, I decide to embark on another transformation—to leave the art world and become a patient advocate. Nice thought—but what exactly does it mean to be a patient advocate? As I move past the initial shock, fear, and disruption of my diagnosis, I begin to realize that I have a future. A shaky, uncertain one to be sure, but one that both demanded and allowed me to think about what mattered in my life. I have to acquire the confidence and skills to speak up, ask questions about my cancer and its treatments, and inquire about the impact that all of this would have on me. I can no longer simply be the passive recipient of decisions made about me, without me, no matter how well-intentioned and clinically sound they are. For me, as for some people who face a serious illness, the first step in advocacy is learning to be an effective advocate for myself. My cancer diagnosis came in the early 1990s, in the midst of an era of nascent cancer advocacy of a very different ilk—a movement that was public, political, and increasingly effective. Beginning in the late 1980s, HIV/AIDS activists raised their voices to turn hopelessness, stigmatization, anger, and despair into activism that sought not just understanding of the human toll of the plague, but more research dollars and better access to treatment. Building on the lessons learned from AIDS activism—whose advocates learned from the disability rights and women’s health movements—cancer advocacy was led by breast cancer advocates. These were courageous women who hit the streets, clinics, and media, who engaged policy makers to convert breast cancer from an unmentionable private form of suffering to a tidal wave of awareness coupled with a new concept of very public cancer advocacy. Progress requires a commitment to questioning the status quo and to working toward a better future for everyone. 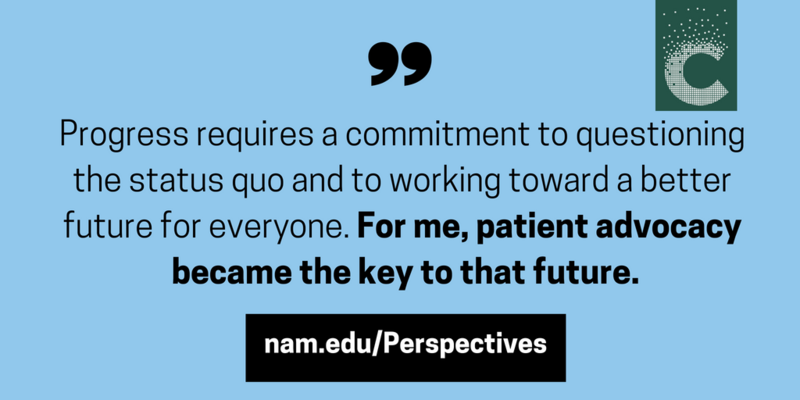 For me, patient advocacy becomes the key to that future and the focus of my advocacy efforts. Flash-forward about 20 years. A routine clinical breast exam, then a biopsy, and a knock on the exam room door—there’s more bad news. This time, it’s breast cancer. And more good news—the tumor is small, the stage is early, the cancer is a non-aggressive cell type. Odds are I’ll survive—again. But I never saw it coming. I guess I should have. The numbers are there. Young women who receive chest wall irradiation have a significantly increased chance of developing a second cancer, with the highest risk being for breast cancer. Still, as the British say, I’m gobsmacked. This time, I’m a very different person, and the field of advocacy has evolved considerably. The passive young woman who sat by quietly, trusting her doctor and father to decide her fate, is long gone. In the 20-year interval between cancers #1 and #2, I have married a man whom I love deeply, who loves me, and who has brought his two wonderful children into my life. My stepdaughter reacts with shock and obvious fear when I tell her I have breast cancer, and I feel the weight of taking care of my family as well as myself this time. So, I must be an advocate for my husband and children as well as for myself—therefore, on a personal level, the stakes are different this time. The transformation I experienced with my first diagnosis has become my professional life and my passion. I have dedicated the past two decades to bringing forward the voices and experiences of all people impacted by cancer. 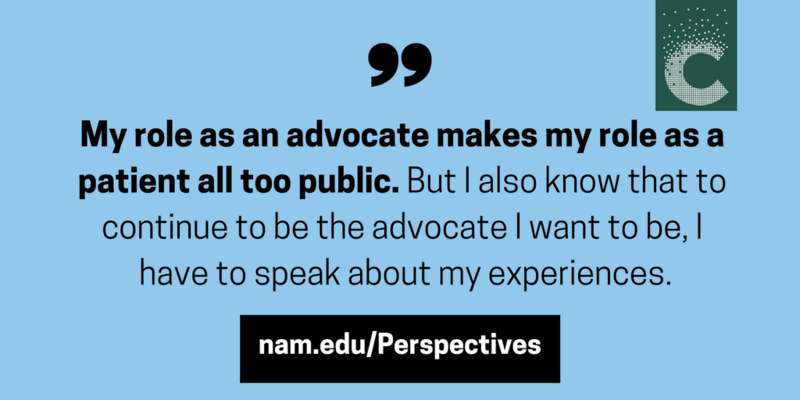 Building upon my experience in the art world and my commitment to achieving equity through elevating and including diverse voices in public and private forums, I dove into patient advocacy—not at all certain where it would take me. I was clear about my values and aspirations; I was somewhat less certain about the means to achieve them. I have edited and published two magazines for people facing cancer: the first focused on breast and reproductive cancers, the second on all cancers and cancer research. I directed an international advocacy program for a major scientific organization and a patient education and cancer registry program for another major group. I have served on a slew of advisory boards and panels and spoken at more than a hundred conferences and events. I have written extensively about cancer survivorship and health disparities. I know in the course of those efforts, I have made a difference. I made more people aware of the key issues of patients and caregivers—both on the individual as well as health care–system levels. I have trained advocates from around the world to be better advocates for themselves as well as for their communities. I feel confident that side-by-side with other advocates, I have helped people to understand what advocacy can achieve and why it is important. And, in devoting myself to improving the experiences and outcomes of the patients and families who came after me, I also healed myself. I found a community of people who helped me transcend the alienation and fear that a diagnosis of cancer can bring. But I am not ready to go through cancer again. While my experience with cancer is the driving force for much of what I do, in other ways, I have put my own cancer behind me. I find myself struggling with the gap between past and present, between being a survivor and a patient. It’s difficult to have to talk about this new diagnosis and its treatment and to face the uncertainties and the inherent awkwardness and emotional pain of patient-dom in real-time, at this very personal level. Everyone—family, friends, and colleagues—is incredibly supportive, but I am far more comfortable giving support than receiving it. My role as an advocate makes my role as a patient all too public. But I also know that to continue to be the advocate I want to be, I have to speak about my experiences with this new diagnosis. My core value of ending private suffering and creating a community of understanding and action requires that I make the transformation from public cancer survivor to public cancer patient. With more than 20 years of advocacy experience, I’m well-informed about my condition and have the wherewithal to engage my surgeon and oncologist in an open discussion of my options. My evidence-based treatment options are limited by the radiation I received for non-Hodgkin lymphoma. I have to have a mastectomy. My only big decision is whether to have reconstruction and what type of reconstruction is best. I choose to have reconstruction—a DIEP flap procedure—and end up learning another important lesson about being a patient. Even when you think you have asked all the right questions; the actual experience brings physical and emotional issues that you did not and often cannot anticipate. It is three years after my breast cancer diagnosis, and I’ve gotten used to the idea of being a two-time cancer survivor. The breast cancer is pretty much in the rearview mirror. I allow myself, once again, to believe that I am done with having cancer—that I can return to being an advocate, not a patient. In fall 2017, I don’t feel right and make an appointment with a new gynecologist. Unlike my LA doctor, she takes my concerns seriously; she works as my partner to determine what is wrong and what to do about it. Tests reveal cancer #3—endometrial cancer. This one, too, may be a result of my treatment (for breast cancer). Tamoxifen, my treatment for breast cancer, is to uterine cancer what chest wall irradiation is to breast cancer. It may all be connected. Again, the good news—this type of endometrial cancer is easily treated with surgery alone. The surgeon actually calls it boring, comparing it to dandruff—an annoyance, but not something life-threatening. My husband and I groan about the inappropriate analogy, but I cautiously accept the doctor’s assurances about the outcomes. I book the surgery after my scheduled vacation to Australia and then take a few days off before getting back to work. I know I am pushing too hard, and there are days when I regret it, but I am not giving in to this thing. It is not going to control me. I’ve been here before. It’s a jolt to hear those words a third time, and it feels unfair, but fairness never had anything to do with it. Once again, I have to tell my family, my colleagues, and my friends that I am a patient. Once again, I have to consider what my experience with this disease means in terms of my own role as an advocate and the broader aims of advocacy. And, once again, I am a public cancer patient. In the 25 years since my first diagnosis, a lot has changed. Every cancer uniquely transforms the individual who experiences it. Some of that transformation happens to us; some we choose. The reality of cancer can force us to think about who we are and what matters to us in life, and to find effective ways of expressing those goals and values. The lens through which I see the experience has changed as well, as I have moved from a young adult diagnosed with non-Hodgkin lymphoma to a woman nearing age 60 and diagnosed with her third cancer. On the day that my father and oncologist stood outside my room, I was not sure that I had any future. Twenty-five years after my first diagnosis, I can look back on my life and its personal and professional challenges, achievements, and satisfactions and know that, whatever happens, I have made choices that have made a difference for myself and others. Throughout my patient advocacy career, I have focused on ensuring that the core value of self-advocacy—“nothing about me, without me”—is a universal value of the health care delivery system. Everyone who is facing a serious illness must be treated with dignity, respect, and compassion—and must be given the opportunity to define what it means to be co-creators of their own health and care. My aspiration is a health care system in which patients and their physicians are truly equal partners, each with our own expertise and experience that is deeply respected by the other party. It is straightforward but not simple to achieve. There will always be tension in the broad, complex, and multidimensional world of biomedical research and health care delivery. We will always need advocates to push for increased health equity, better care, more research, and more person-centric policies. My own experience has deepened my belief that transformation is possible. Darien, G. 2018. Transformation: My experience as a patient and an advocate in three chapters. NAM Perspectives. Commentary, National Academy of Medicine, Washington, DC. https://doi.org/10.31478/201810d. Gwen Darien is Executive Vice President for Patient Advocacy, Patient Advocate Foundation and National Patient Advocate Foundation. This essay would not have been possible without the support of Christine Wilson, Vice President, Advocacy Communications, Patient Advocate Foundation, National Patient Advocate Foundation; and Mary Jackson Scroggins, founding partner, Pinkie Hugs, LLC, and co-founder, In My Sister’s Care. 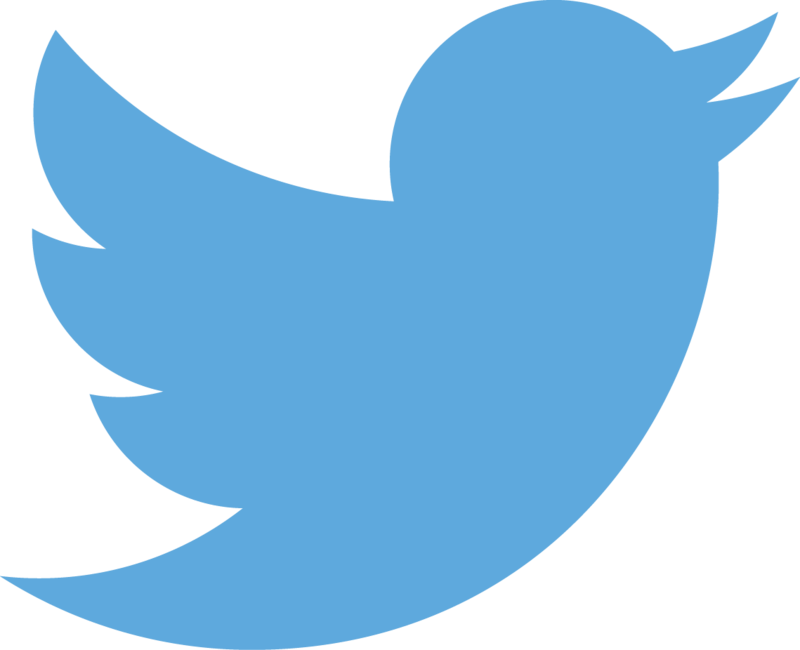 All questions and comments should be directed to Gwen Darien at gwen.darien@npaf.org.